Sandra McElroy, aka witness #40, who provided crucial corroborating testimony that convinced a Ferguson grand jury to not indict Darren Wilson for murder. Image from Gawker. I’m not going to post much about this on my own. Long story short, somebody started poking around the ‘evidence’ introduced in the Ferguson grand jury testimony, especially after more of the transcripts were released on December 8. They focused on the testimony of ‘Witness 40’, who corroborated everything Darren Wilson said in his own testimony. 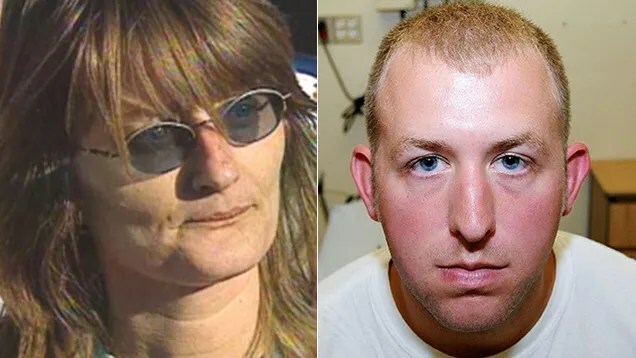 Witness 40’s statements have provided much of the backbone of the right-wing defenders of the Jury’s decision to not return a True Bill, thus clearing Darren Wilson. It is becoming clear that Witness 40, now revealed to be Sandra McElroy, was not a credible witness. An individual who had posted numerous racist rants on social media BEFORE the Michael Brown case, McElroy is also bipolar and has a criminal history. She had no good explanation for how she came to be on the street where Michael Brown was gunned down, and her car does not show up in any of the crime scene photographs. Ms. McElroy had also fabricated evidence in a 2008 crime investigation, where she claimed to have contact with a kidnapper who’d kept a young boy captive for several years. And she did not come forward as a witness until time had passed on the Michael Brown case, indicating that she may have based her testimony on what Wilson had been saying. The story is all online thanks to The Smoking Gun. You can read summations of it on Gawker, and there’s a Chris Hayes video from MSNBC. Shaun King over at DailyKos has provided excellent coverage as well. It’s important to note that McElroy’s testimony was also given to FBI officials, who took the unusual step of warning her about perjury. McElroy’s tale was met with skepticism by the investigators, who reminded her that it was a crime to lie to federal agents. Despite the FBI’s skepticism, McElroy’s testimony was heard by the St. Louis County Grand Jury. All of the above should have been known to St. Louis County prosecutor Robert McCulloch. If he knew that there were genuine questions about whether McElroy was even at the scene to witness the shooting, she should not have been allowed to testify. If this were an actual trial, my guess is that counsel for Wilson would’ve been extremely reluctant to put someone like McElroy on the stand (assuming the prosecutor was doing his job). And yet, since the grand jury system is the prosecutor’s forum, evidence presented is not rebutted as it would be in a true trial. And McCulloch was probably hoping the identity (and background) of Sandra McElroy would never see the light of day. Thus his many protestations of ‘transparency’, even while hiding the fact that one of the star witnesses for the defense was problematic. This is not a simple case of McCulloch having not recused himself. If he knew that McElroy was committing perjury and put her forth as a witness, that might make him subject to criminal sanctions and disbarment for suborning perjury. There’s also a matter of whether McCulloch was obstructing justice. And I’m all for introducing a RICO indictment– McColloch is in charge of a police fraternal organization that funneled money and support to Wilson even while McCulloch was cooking the books on getting a criminal indictment. Darren Wilson isn’t the only one who needs a perp-walk. Next move belongs to US Attorney General Eric Holder. Don’t hold your breath.